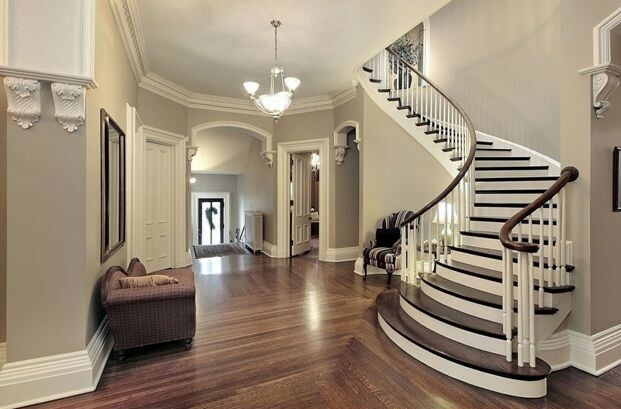 Refinishing the staircase is something many homeowners have on their list of DIY projects, but before they roll up their sleeves, grab the sanding disk, and hope for the best, many years go by, and that nasty carpet that came with the house is still in place. Your staircase is, just like any part of the house, subject to numerous trends and fads, so if you want it to retain its beauty and value over the years, you must be oriented towards design that lasts. And nothing says,”timeless classic” more than the black-and-white palette It works perfectly on walls, furniture, carpeting, flooring – and yes, it works on staircases, as well, no matter if you’re targeting a traditional or contemporary look. Black will sober things up, if they become too glossy, and will add a bit of edginess to boring spaces. Paint the rail and newel posts black to accentuate the curving or enhance the elegance of your entryway with the bold contrast between the dark treads and white risers. Seeing your staircase as merely functional doesn’t do you any good – sooner or later, its lack of character will come to plague the entire entryway and bring your visitors’ spirits down. Jazz up the stairs with a faux staircase runner featuring a lively pattern that will add a completely new dimension to your daily climb, whether you choose to use paint, tiles, or wallpaper. Some of the styles you can consider are Mediterranean, Oriental, vintage, traditional, abstract, or any other style that matches the personality of the house. Tools and materials you need to create whimsical and clever staircase designs include porch and deck paint, tape measure, painter’s tape, a mini roller, a paintbrush, and a pencil. Adding stencils on the risers is the easiest way to upgrade the appeal of your staircase and add an element of surprise – not to mention it wouldn’t even have to be done in special paint, since your feet will never be touching them directly. It’s also one of the least expensive ways to go from dull and carpeted to fresh and inspiring. Paint is what you’re going to use to imprint your personal style on the staircase, but if the permanence of paint intimidates you, go for vinyl decals, which can be easily repositioned or removed entirely. 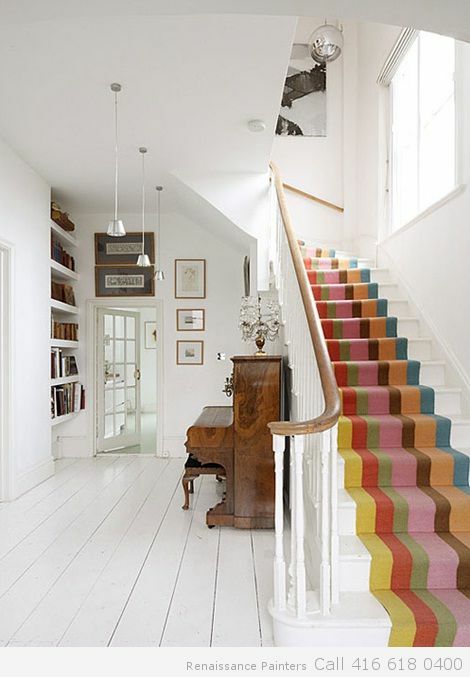 There are hundreds of ideas on how to breathe new life into your staircase, so why settle for that boring, old carpet when you can put your creativity to work and make the staircase a highlight of your home? Go wild and paint lyrics from your favorite songs, rainbows, piano keys, Moroccan patterns, geometrical shapes, or anything that crosses your mind. To get the project completed without mess and disruption, give us a call,and together we’ll explore the creative potential of your stairwell.